The heading shows the name of the project. 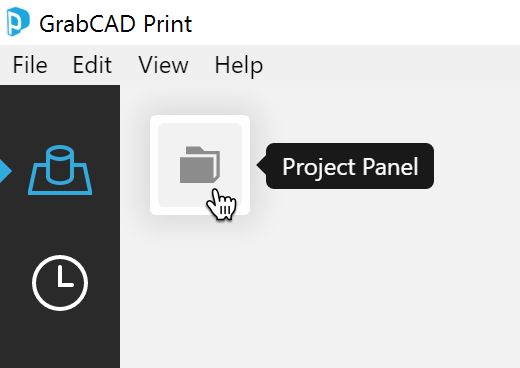 To rename the project, use File > "Save Project As..."
Underneath that is the Add Models button, which will open a dialog where you can locate files. You can also add files to the project with drag-and-drop. If you add more models than can fit on one tray, more trays will automatically be created. You can disable this in File > System Preferences > Model Insert Settings. 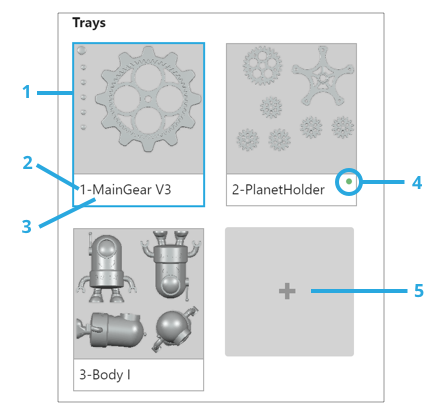 If you have a multi-file STL assembly, you should use File > "Insert STL Files Assembled"
Trays can be deleted by right clicking on the preview, but models on those trays are not removed from the project. Instead they become hidden. Just click the tray name to change the name. When you click Print, the job title will inherit the tray name. 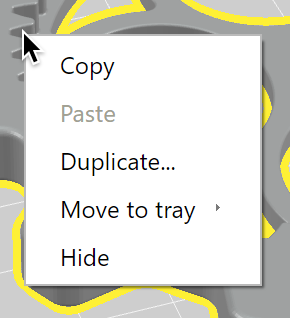 Use the duplicate command to quickly make several copies of the selection. If you have multiple trays in your project, this is the best way to move models between trays. 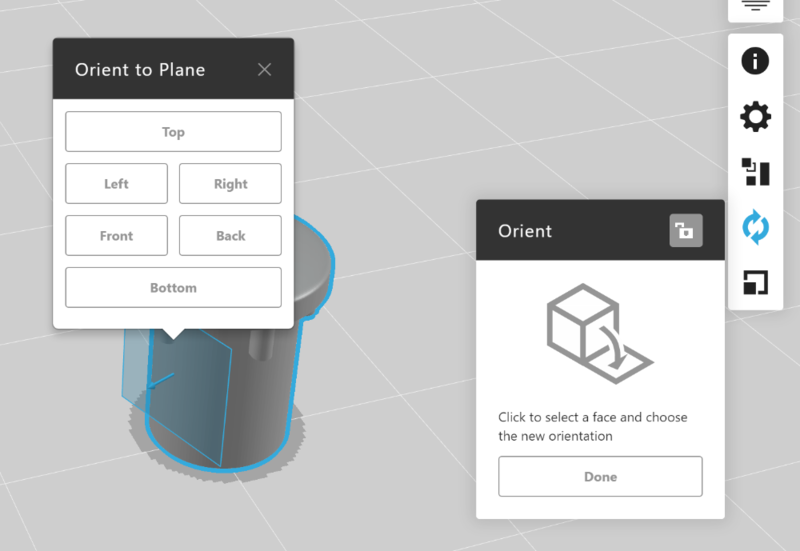 Inside the orient tool, "Orient Face to Plane" will allow you to pick any surface on the model and orient it to a few different directions. You'll also find an Auto Orient button which will choose the orientation which generates the least support material. Arrange this Tray will pick up the models on the current tray (in their current orientation and scale) and place them down on the current tray according to the default algorithm. This may overflow models outside the tray boundaries. Arrange Project will pick up all of the models in the project and place them down them according to the default algorithm. This may move models between trays or create new trays. The Optimize checkbox will slice the tray and then arrange, providing a much closer pack. What is the default arrangement algorithm? Each model is placed within a bounding box of it's maximum dimensions, and sorted from largest to smallest allowing for a 0.25" air gap between models. If there is room for a part on a tray, it is placed down, and if not, it is placed on the next tray. When does the default arrangement occur? Why have we set the default algorithm this way? The default arrangement is designed such that you can always print without any build failures, as long as no one part is too big to fit on a tray. Because drawing a rectangular boundary around a part often creates a lot of empty space, it is usually possible to arrange a tray manually to achieve a closer fit. Trays will fail to build when the supports that are generated around them are within the 0.25" air gap. If model has been sliced, it will show a red highlight when it is too close to another model. To enable overlap detection, Estimate the tray. Models will remain sliced if they are moved around the tray, moved between trays, or hidden and unhidden. 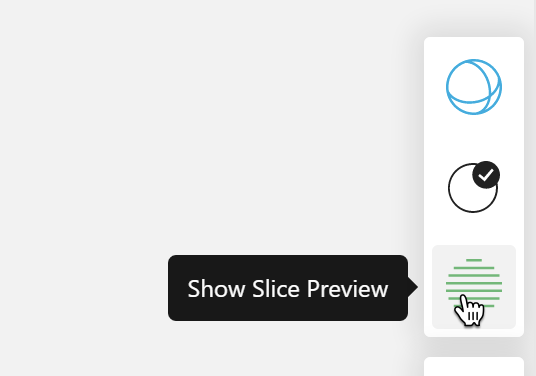 Even duplicates of a sliced model will be sliced. However, if you change a models scale, print settings, or orientation, it will need to be sliced again in order to see overlap detection. Hit Estimate to slice the tray again. Move all models to one tray. 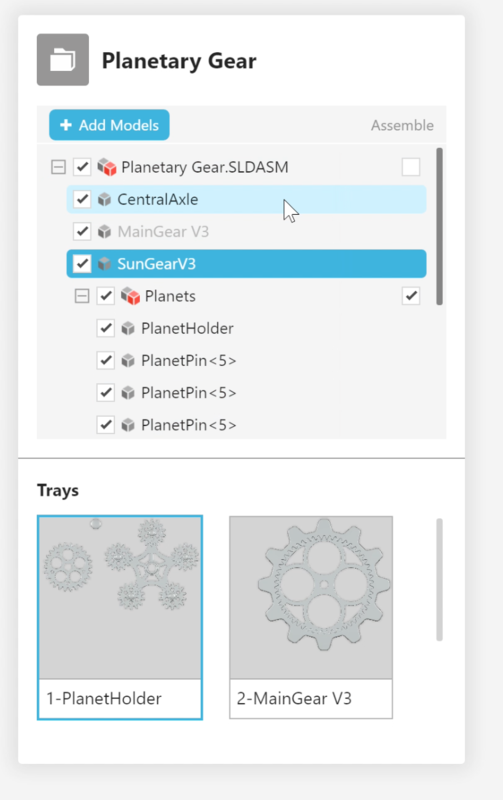 TIP: You can prevent new trays from being automatically created under File > System Preferences > Model Insert Settings. 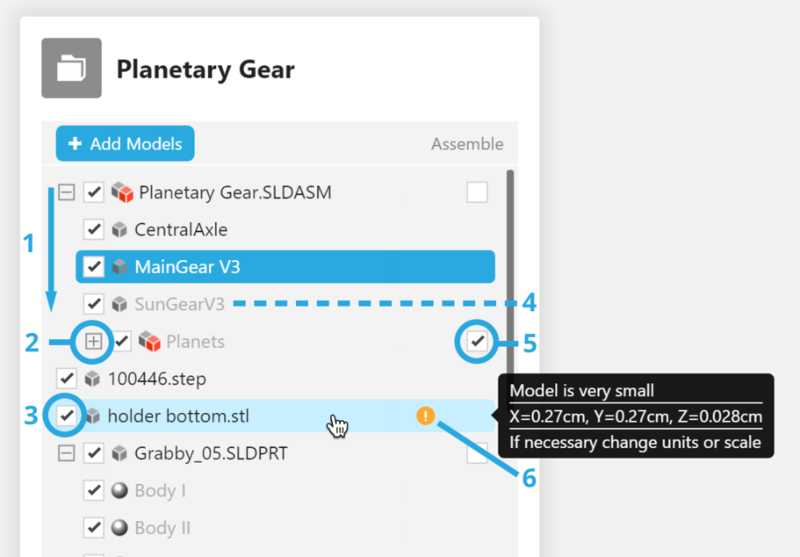 Scale, orient, and adjust material settings as desired. 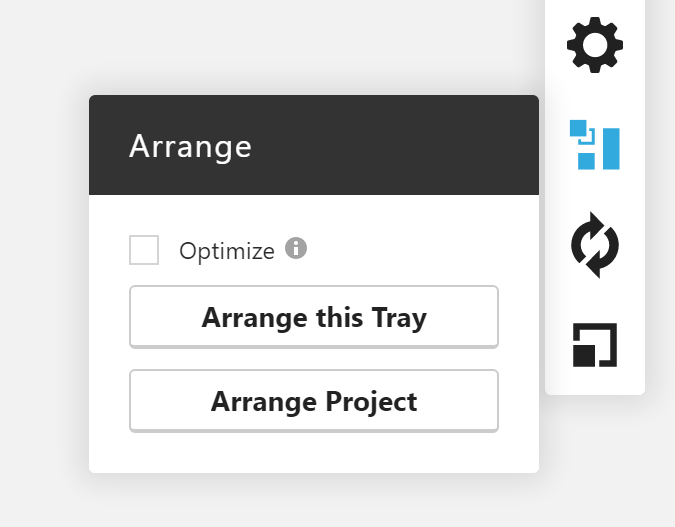 Open the Arrange tool, check the Optimize checkbox, then hit Arrange this tray. 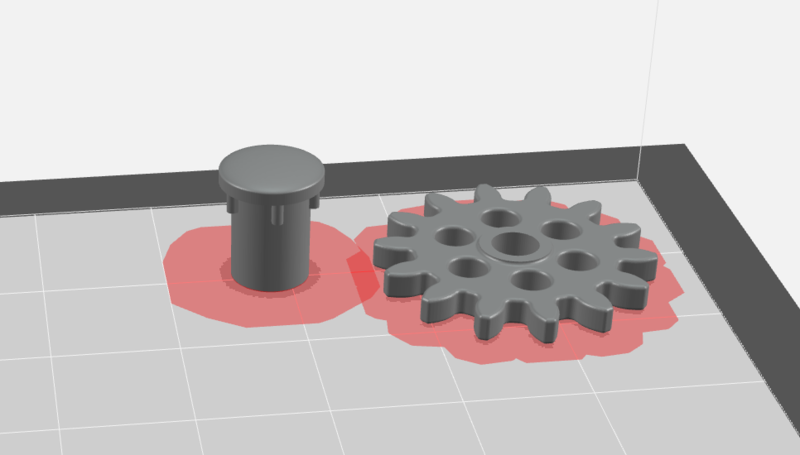 FDM prints can be paused between layers so that users can swap material colors mid-print, or add an insert. 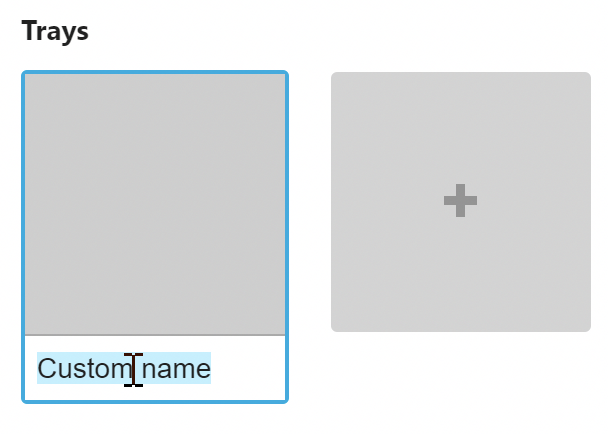 Select the desired layer using the arrow keys or the vertical slider on the left. 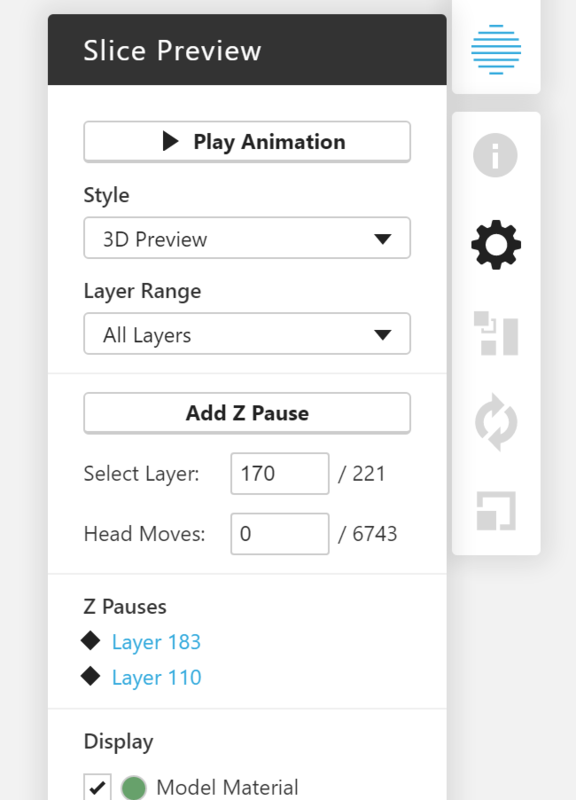 Click "Add Z Pause" to insert a pause at the start of the layer. To remove a pause, select the layer and click "Remove Z Pause."